Brest is a major port in the northwestern part of Brittany, in the department known as Finistère. Finistère translates as "end of the earth," or lands end. Perched on the ocean at the far northwestern end of Brittany (map), Brest can seem far away. But it's only 71 kilometers (44 miles) from Quimper, via the beautiful Crozon Peninsula. Although Brest has a long history, thanks to its strategic location and heavy bombing during World War II, little remains of its past. The Château on the water provides a glimpse of the past. Brest also has a long naval history and has been a port for both military and civilian ships. Today ferries and cruise ships often call at Brest. One of Brest's best-known attractions is Océanopolis, a large aquarium that focuses on oceanographic research. Other attractions include a fine arts museum, the Tour Tanguy, which presents pre World War II history, and, fittingly, a marine museum. 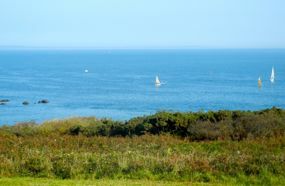 Above, Sailboats off the Brittany coast.